A waiting customer is not a happy customer! Quick response is the new mantra that works in the digitized world we live in. And this extension helps you to send an automated response to the waiting customer, who will get an exact idea on when to expect a response from you. As you know, Magento has a ‘contact us’ form which allows a customer to get in touch with the Merchant. In the native Magento, once a customer fills up and submits this form, the merchant receives an email with the data filled by the customer. 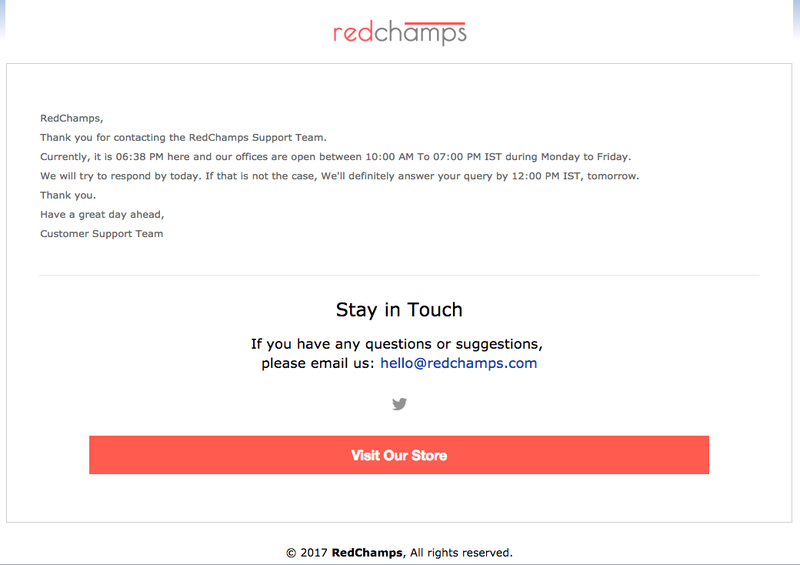 The “Smart Autoresponder” extension by RedChamps allows you to send a quick, automated response to the customer, who has just filled the ‘contact’ form, informing him that his request has been received by the merchant successfully. The email also gives an approximate time when the customer can expect a response. Example: Consider that your team works between 10 AM to 7 PM and your average response time is 2 hours. Now, if a customer fills in and submits the contact form on your store at 2 PM, then he/she receives an automatic email with the information that they can expect a response within 2 hours today. Please note that the ‘Smart autoresponder’ Magento extension is integrated with the ‘contact us’ form by default. But the extension can be made functional with other custom forms in the Magento store as well. As per your request, we can integrate the extension with other custom forms. The below image shows an example autoresponder email triggered by the extension. Customer satisfaction is what you get! Once the customer knows that his request has been received, and gets an approximate time frame by which he can expect a response, he will not get impatient about the wait. 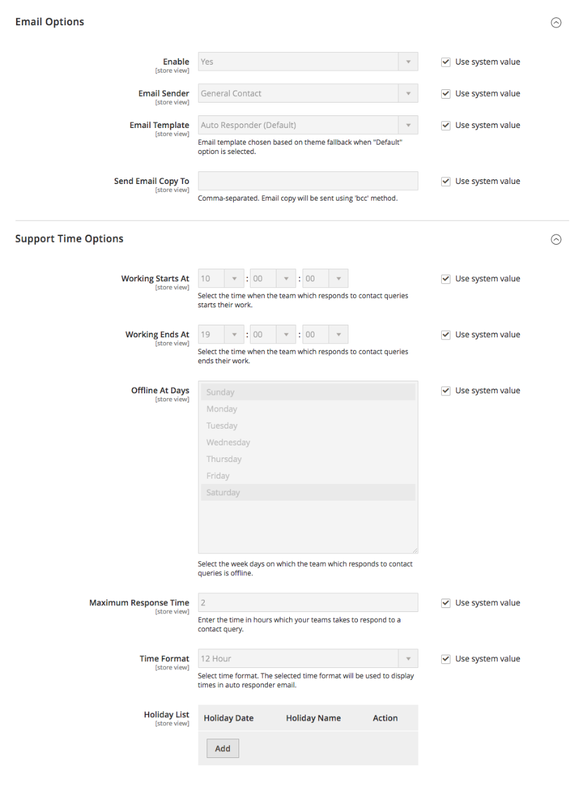 Supports time zone configured in the admin: We take care of your store’s time zone when we mention the time in email templates ( evaluating response time for the customer, or sharing store’s working hours). Autoresponder email can be edited from the admin panel: As per your requirements, you can update the email and add appropriate content. Takes care of you weekends and holidays: An automated system allows you to lead a calm weekend/holiday(s). We will share the information about your holidays and weekends and the consequent response time with the customer. Supports both 12 hours and 24 hours format: The extension supports both the formats and you can select one as per your choice.